Don’t miss Dean Martha Thorne LIVE today on Facebook where she will analyze the 2018 Pritzker Prize. 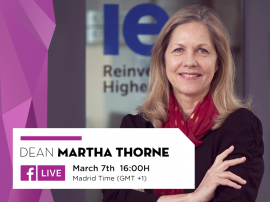 Martha Thorne is Dean of IE School of Architecture and Design. Since 2005, she has served as the Executive Director of the Pritzker Architecture Prize, popularly known as the “Nobel Prize for Architecture”. Her interests have always focused on international contemporary architecture, cities in evolution and changes in the role of the architect. Prior to joining IE University she was Associate Curator of the Department of Architecture at The Art Institute of Chicago. During her tenure at the museum, her responsibilities involved curating many exhibitions, developing publications, and participating in the ground-breaking study on collecting, archiving, and exhibiting digitally created design materials. She is the co-author of the books Masterpieces of Chicago Architecture and Skyscrapers: The New Millennium, editor and author for The Pritzker Architecture Prize: The First Twenty Years, and author of numerous articles for architectural journals and encyclopedias. Martha Thorne received a Master of City Planning degree from the University of Pennsylvania and a Bachelor of Arts degree in Urban Affairs from the State University of New York at Buffalo. She undertook additional studies at the London School of Economics. She currently serves on an international jury for the award, ArcVision: Women and Architecture, a prize honouring outstanding women architects. She also lectures and assists with international architectural competitions.